Zipangu Fest and Cigarette Burns Cinema present a Triple Creature Double Feature in 35mm and full extra widescreen TohoScope! The UK’s favourite Japanese film festival bursts back into 2012 with a monstrous retro kaiju double bill collaboration with independent cult cinema exhibitor Cigarette Burns Cinema. 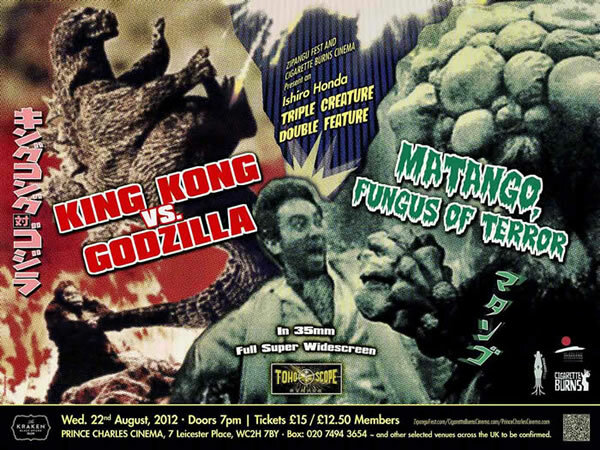 On Wednesday, 22nd August 2012, horror, sci-fi and kaiju fans can catch this unique screening of both King Kong vs. Godzilla and Matango, Fungus of Terror, both showing in their English language versions, at the Prince Charles Cinema in Central London. This double whammy from the legendary director Ishiro Honda, creator of Godzilla and the mastermind behind some of Japan’s most inventive and memorable apocalyptic visions, will be a unique opportunity to enjoy both films as they were meant to be seen, on 35mm and in full widescreen TohoScope, on the big screen. King Kong vs. Godzilla (1962) sees the world’s two most monumental movie monsters go head-to-head, slugging it out in their first ever colour widescreen outing. The film remains the most commercially successful of all the Godzilla films to date. Matango, Fungus of Terror (1963), a hallucinogenic horror adapted from the 1907 short story “The Voice in the Night” by the English author William Hope Hodgson, follows a yacht full of privileged Tokyo-ites who are forced to face their primordial selves after they find themselves washed up on deserted tropical island festooned with clumps of deadly fungus.